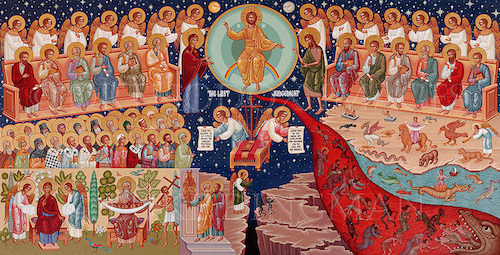 The Sunday of the Last Judgement is also called “Meatfare Sunday”. Today is the last day for eating meat until Pascha. Eggs and dairy products are permitted every day during the coming week. This helps us prepare for the more intense fasting of Great Lent, which begins 8 days after Meatfare. In today’s Gospel reading, we hear “I was in prison and you came to Me.” We encourage you to visit our prison ministry page. Read the letters the prisoners have sent us, and please consider a donation. Even small donations are helpful. One can observe all of the fasts, all of the rules, not miss a single church service, and yet if he has no compassionate love for his neighbor, then all the rest is in vain, because our heart has turned to stone…But if we will lead a pious life full of compassion and empathy, then we are already on the right path&hellipWe often judge or even spread rumors about people, instead of looking on, or else at least saying, “Hello,” or “Greetings with the feast,” “How are you doing?” Even these simple words can bring a person to salvation. Let us consider this, brothers and sisters, and may the Lord God help us.